Archbishop Emanuel Gerada died yesterday morning, aged 90. Archbishop Emanuel Gerada, who was instrumental in negotiating the 1969 agreement between the Church and the Labour Party, died yesterday, aged 90. Described as a generous, well-read and intelligent man, the Vatican diplomat made international headlines in 1980 following the assassination of Archbishop Oscar Romero in El Salvador, where Mgr Gerada was apostolic nuncio. His friends and colleagues, Fr Frans Schembri and Mgr Arthur Said Pullicino, recalled the landmark moments in the life of Mgr Gerada, who was ordained in August 1943. After obtaining his doctorate in Canon Law and pursing a course leading to diplomatic service with the Holy See, he travelled to many countries as a Vatican representative. 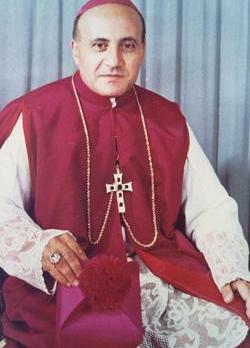 In 1967, Mgr Gerada returned to Malta from Mexico when he was appointed auxiliary to Archbishop Michael Gonzi. “When he came back to Malta, he was intended to be the successor of Archbishop Gonzi and was given the task of finding a solution to the issue between the Church and the Labour government,” Fr Schembri said. Following politico-religious disagreements between the Catholic Church and the Labour Party, led by Dom Mintoff in the early 1960s, the Church had issued religious sanctions against the party. Catholic Labour supporters were denied burial in the blessed part of cemeteries and voting Labour was declared a mortal sin. In 1969, the two sides reached an agreement and the Church lifted its sanctions against the party. In 1973, Mgr Gerada resumed his career in the Holy See’s diplomatic service and was appointed apostolic nuncio to El Salvador and Guatemala. El Salvador Archbishop Oscar Romero was shot dead while celebrating Mass on March 24, 1980 after denouncing human rights abuses in his country. His outspokenness was not appreciated by the Vatican which, at the time, was represented by Mgr Gerada. Fr Schembri said there were two interpretations of what had happened. Some said Mgr Gerada had advised Mgr Romero to tone down his message as he was endangering his own life. But others believed Mgr Gerada had asked Mgr Romero not to voice his beliefs. Mgr Gerada’s next postings were those of apostolic nuncio to Pakistan and Ireland. He retired in Malta in 1995 and lived in his hometown, Żejtun. His niece, Louise Farrugia, always remembered him as a very generous and loving uncle who went out of his way to help everyone. He was also intelligent and a successful diplomat, she said. “He was always the uncle who came from abroad, so it was very exciting to see him... I remember one time when I was a child I was really happy when he got me a perfume from Ireland,” she recalled. He was very close to her father, his late brother, who passed away while he was based in Pakistan in 1987. “He took it upon himself to take my mother there for three months to distract her from her grief... She returned a changed woman as she helped bring a baby for adoption to Malta,” Ms Farrugia recalled. Mgr Gerada’s funeral cortege leaves Mater Dei Hospital on Monday at 4 p.m. for the Żejtun parish church. A cortege leaves Carlo Diacono Square at 4.30 p.m. for the oratory (near the parish church) where Mgr Gerada will be lying in state till 8 p.m. On Tuesday, the public will be able to pay their last respects between 7.30 and 10 a.m. The cortege then leaves at 10.30 a.m. for St John’s Co-Cathedral, Valletta, where the bishop will lie in state till 2.30 p.m. Funeral Mass will be held at 3 p.m. celebrated by Archbishop Paul Cremona. Mass will be followed by interment at the family grave in Żejtun.